Join 100+ kayak anglers for a weekend of fishing, camping and fun. Lots of prizes for biggest striper, bluefish, and white perch as well as a raffle. Based out of Camp Wright in Stevensville, MD near the Bay Bridge. All proceeds will to be donated to CCA and Heroes on the Water. Participants are permitted to launch from the Camp Wright beach for free. Kayak wheels recommended. Participants can launch from any public launch on Kent Island. Parking pass is required when using public boating access. Daily passes are available at Angler's or Chesapeake Outdoors for $10. Public Launches in Anne Arundel, Queen Anne's and Talbot counties. Participant can also launch from any publicly accessible launches in the following MD counties: Anne Arundel, Queen Anne's and Talbot. Fees may apply. Camp Wright - Optional, but recommended. Launch from Camp Wright or any publicly accessible launch in Anne Arundel, Queen Anne's or Talbot counties. Must be in line at Camp Wright by 3:30 PM to enter fish. This is a Catch-Photo-Release tournament. All fish and crabs caught must be released. o	And any other pertinent regulations not specifically listed herein. PARTICIPATION: All anglers must use or share a kayak, canoe, standup paddleboard (SUP) or other approved angler powered craft. Approvals shall be granted on a case by case basis. Tournament director will have final say. Piggybacking on powerboat or use of other gasoline or propane motorized craft (i.e. Jet Ski) is not allowed. Battery powered electric watercrafts are allowed. ELIGIBILITY: Tournament is open to anyone 18 years old or older. Minors are eligible to participate with a parent or legal guardian signature on the release form. The parent or legal guardian who signs must participate in the tournament and ensure that the minor complies with all USCG regulations, Maryland Department of Natural Resource regulations and tournament rules. CAPTAINS MEETING and REGISTRATION: Captains meeting is NOT MANDATORY. However, it is incumbent upon each participant to familiarize themselves with these rules and tournament boundaries. Each participant will be given a unique token, tournament will also provide measuring device. Registration will be open until 5:30 pm on night of Captains meeting. Meeting will start at 6:00 pm. LAUNCH: Launch shall be from the beach at Camp Wright or any publicly accessible kayak/canoe launch location in the following MD counties: Anne Arundel, Queen Anne's and Talbot. o	For the Camp Wright launch a kayak – canoe cart is recommended, launch site is approximately 400 yards from tent/cabin area. o	For any public launch sites participants are responsible for any ramp fees, park fees, access fees, etc. FISHING HOURS: Safe light to be announced at Captains Meeting. The fishing tournament will officially be over at 3:30 pm, you must have weighed in or be in line to weigh in by 3:30 pm. FISHING BOUNDARIES: Maryland tidal waters of Anne Arundel, Queen Anne’s or Talbot Counties of the Chesapeake Bay and tributaries. FISHING METHODS: All fish must be caught using rod and reel (hook and line). Artificial or natural bait (shrimp, crab, minnows etc) is permitted. You must comply with all Maryland DNR regulations as to number of rods, type of bait, size of bait, number of hooks, etc. Wade fishing is allowed if kayak/canoe is tethered to angler. FISHING LICENSE: A valid Maryland fishing license is required. You may have a reciprocal license, i.e. your state fishing license is also valid in Maryland. It is up to the angler to verify the regulations and prove their license is valid on the day of the tournament. CHECK-IN: We encourage all catches be submitted using the iAngler App. You will use the app to enter photos while competing in the tournament. If you prefer to turn in your photos in person, you can start checking in (i.e. turning in your fish photos) at 12:30 pm at Camp Wright. All anglers must have photos submitted via iAngler or be in line by 3:30. Once the official Tournament clock reads 3:30 pm the tournament is considered closed. If you are in line at that time you will be allowed to check in. Remember to bring your camera and cord or memory card. Tournament is not responsible for any camera malfunctions, dead camera battery, etc. SCORING: The tournament uses catch-photo-release scoring determined by the length of each fish, combined in the case of slam and individually for each class. 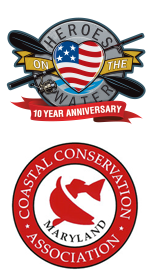 Each angler will be issued a uniform measuring device and unique scoring marker/token at the Captains Meeting or in the morning prior to launching. The first photo on the camera must be of your rigged boat as put in at launch with measuring device and scoring marker visible. Fish must be photographed in or on the boat, on the provided measuring device with the numbers clearly showing. Length is determined from the forward most point of the fish with the mouth closed to the natural un-pinched top of the tail. Fish must meet Maryland DNR minimums to count. In the event DNR minimum lengths are not caught participants are invited to photograph smaller fish or blue crabs so that we can determine winners for each category. Should insufficient entries be made the judging committee will move the prize category to the raffle. In the event of a tie for any prize the entry checked in earliest will declared the winner. The judging committee will verify all photos and measurements. The Tournament Director is responsible for the final call in all matters. Each fish can only be entered in a single division. PROTEST: All protest must be presented in writing with-in 30 minutes after participant weighs in. The tournament director is the final authority in all considerations. RELEASE OF LIABILITY AND COVENANT NOT TO SUE: A waiver, release of liability and covenant not to sue are part of the entry form. This form must be signed to participate in the tournament. It is required that all anglers take responsibility for themselves while participating in the tournament. SPORTSMANSHIP: This event is being held at Camp Wright, which is a children’s summer camp. All contestants are required to follow high standards of sportsmanship, courtesy and conservation. No alcoholic beverages or use of illegal drugs is allowed. Any use of drugs, participation in illegal activities, or other conduct reflecting unfavorably upon our efforts to promote safety, sportsmanship, fair competition, and/or compliance with tournament rules are grounds for immediate disqualification and return of any prizes awarded. PETS: No pets are allowed in Camp Wright. RULE CHANGES: These rules are subject to change at any time before start of event. Participants will be notified of any changes as soon as possible before the morning launch. Rule interpretation is exclusively left to the tournament director. The decisions of the tournament director are final and not subject to appeal. PRIZES: Tournament prizes will consist of equipment and gift cards. There may be some cash prizes depending on sponsor contributions and number of entrants. Contestants are only eligible for one of the class prizes. Final prize list will be determined closer to tournament time.